By putting Günther Oettinger in charge of the digital economy in the new European Commission, President-elect Jean-Claude Juncker has committed a fatal mistake, said MEP Jan Philipp Albrecht, warning that Oettinger risks being “crushed” by his new portfolio. 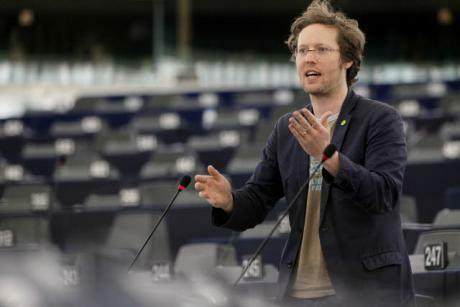 Jan Philipp Albrecht is a German MEP for the European Greens, serving in the European Parliament since 2009 and currently acting as deputy chairman in the Committee on Civil Liberties, Justice and Home Affairs. The 31-year-old is known for his activism in the area of data protection, which earned him the nickname “Mr. Anti-SWIFT” during negotiations with the United States on the issue. He spoke with euractiv.de’s Dario Sarmadi. Chancellor Angela Merkel had hoped Günther Oettinger would get the coveted trade portfolio. But now he has been appointed commissioner of the digital economy. What happened? I can absolutely not understand how you can give Oettinger the responsibility for the digital agenda. A man with absolutely no previous experience. Could Oettinger’s appointment be a strategic decision on Juncker’s part, against Germany? In the past, the German government has not exactly demonstrated that it takes the EU seriously. For years, it has been pushing parallel legislative procedures and simultaneously hindering EU legislation. Juncker’s decision could be a response to that. In light of the data protection reforms which were delayed by Germany, it resembles a transfer to the home front. Oettinger’s appointment will not help the digital economy and society at all. Someone is needed who is abreast of digital issues and has tackled questions over the digital transformation before. Why do you doubt Oettinger? Oettinger does not even use social media, for example. He barely communicates publicly with people on the internet. Instead, he is a man of classical media. As regional prime minister and as energy commissioner he devoted himself to traditional issue areas. This will be an enormous challenge for him. And we need someone who can immediately get down to business. But as Energy Commissioner Oettinger demonstrated his ability to familiarise himself quickly with the issues at hand. Over time he has gained the reputation of a respectable commissioner. A respectable energy commissioner? He let his agenda be guided by large energy corporations, precisely because he was so unprepared to take on such responsibility. In cases like this, it is easy to get taken in by the big players. Could that happen to him again as digital commissioner? Definitely. Giants like Google, Amazon and others are a big problem in the internet economy. Small and medium-sized enterprises as well as many start-ups are latently dependent on industry giants. If Oettinger knew the digital economy well, he would know how to stand up to the giants from Silicon Valley. What implications can consumers expect from Oettinger’s appointment? There will not be any improvements for them. In my view, a much bigger concern is the increasing power of large internet and telecommunications providers. Big corporations will continue to divide the market among themselves. As a result, it will become increasingly difficult for consumers to choose freely. Together with other commissioners, Oettinger is supposed to tackle the Data Protection Directive in the coming term. You are one of the leading rapporteurs in the European Parliament on this. What do you expect? Well now it is up to him to ensure that we finally reach an agreement over data protection. Up till now the German government has prevented a compromise in the Council of Ministers. Oettinger’s task regarding this reform is to corral his own government to an outcome. The new digital commissioner is also charged with negotiating new rules for the telecommunications market in the future. That will also deal with the sensitive topic of internet neutrality. The European Parliament has firmly anchored internet neutrality in its draft regulation. This choice of direction must now be asserted in negotiations with the Council of Ministers and the Commission. There, Oettinger must hold his ground opposite powerful lobby groups – not constantly undermine the principle of internet neutrality like his predecessor Neelie Kroes. We will insist on that during his hearing in the European Parliament. The approval of the Commission is practically a done deal. Juncker’s team seems to have a considerable parliamentary majority behind it. What do you hope the upcoming hearing can achieve? Oettinger is under an enormous amount of pressure – and not because he risks falling short of a majority. It is much more likely that he could get crushed by this new burden. He must really immerse himself in the issues over the next few days. After all, he is not the only one who will be handling digital interests. There is V?ra Jurová, new commissioner for justice and consumer protection, as well as Vice-President Andrus Ansip in charge of the digital single market. What kind of problems could that create for Oettinger? If Oettinger makes a poor impression in front of committee members in the European Parliament and cannot offer any answers to key questions, he will quickly be circumvented by other commissioners. In that case he would lose the authority to oversee his topics.